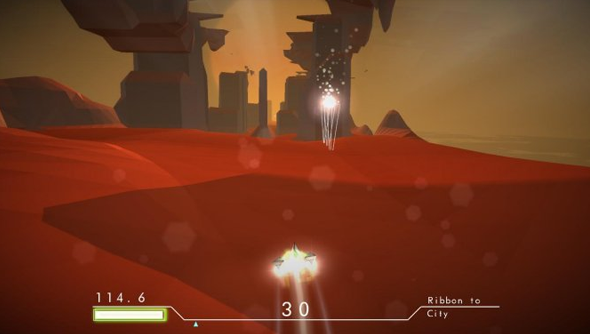 Big Robot may be hard at work on Sir, You Are Being Hunted but that’s not stopped Tom Bett’s from throwing together a procedurally generated racing game. He’s dragged in code and systems designed from the developer’s original game project, Lodestone. A game that, still, hasn’t seen the light of day. It’s a little like WipeOut, it’s a little like Fervour, it’s a little brilliant. There’s something about knowing there’s no end which makes me quite calm. Racing games often have me tense up, constantly thinking about the car I need to overtake before the next lap, the turn that will ruin my time if I mess it up. If there’s no end to the race though I just go docile and enjoy it. PermutationRunner is the hot bath of video games. You see the level ahead of you generating as a slow rolling wave. The particle effect warp tunnel that surrounds you when you boost is rich in colour and soothing. Even the sound of picking up boost stars is pleasing. The whole thing is free, too. You can find it on Big Robot’s site. It’s only a little test project for Betts but I do hope the team consider turning it into something larger and more developed. I’d love to see more varied environments, for instance.